One of the most common birth defects, occurs in approximately one in 700 births. The National Down Syndrome Society estimates that there are more than 400,000 people living with Down syndrome in the U.S. It's a genetic disorder, resulting from having three copies of chromosome 21, instead of the usual two copies. Parents and doctors have known for a long time that children with DS tend to grow more slowly and are shorter than most other children. 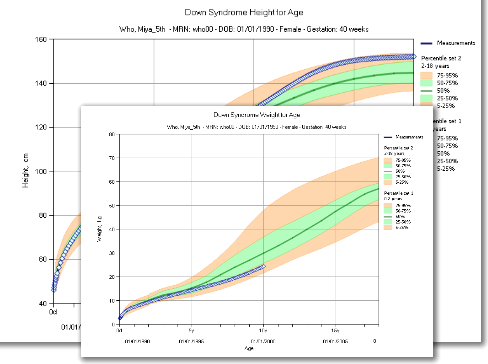 Please note that according to American Academy of Pediatrics previously used Down syndrome-specific growth charts no longer reflect the current population styles and body proportion. Until new charts are developed, patterns of growth and weight gain should be followed on the available standard growth charts.